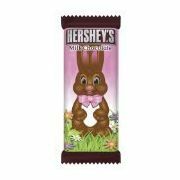 Don't forget to buy a Hershey's bunny for your Easter Basket. You get a 1 oz solid milk chocolate bunny. Buy just a single bunny or many bunnies. You can never have to many chocolate bunnies in your Easter Basket.